The next upcoming Easter is on Sunday April 21st, 2019. Easter celebrates the resurrection of Jesus Christ. The day of Easter falls on a Sunday based on the lunisolar calendar, not a fixed date on the Gregorian or Julian calendar. It has been determined to fall on the Sunday after the full moon following March 21 for Western Christians. Thus Easter will fall between March 22nd and April 25th each year. Although it is not a federal U.S. holiday, many stores are closed or operate minimal hours on this day. Numerous churches hold Easter services celebrating the resurrection of Jesus Christ from his crucifixion. The Easter lily is a symbol of the resurrection. 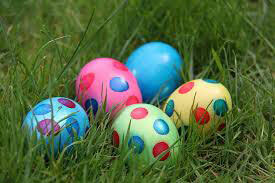 Easter eggs are made using hard boiled eggs dipped in colored dye on the outside. Easter candy is hidden in plastic eggs. Both are used in Easter egg hunts organized by churches, local businesses or families. An Easter basket is used to collect the eggs. The Easter bunny is also a symbol of the holiday. The foundation of the Christian faith from the New Testament is the resurrection of Jesus from his crucifixion 3 days earlier which is observed as Good Friday. This establishes Jesus as the Son of God. Those who believe in Jesus' death and resurrection are calendar "a new birth" and receive eternal salvation. Jewish Christians were the first to observe Easter.